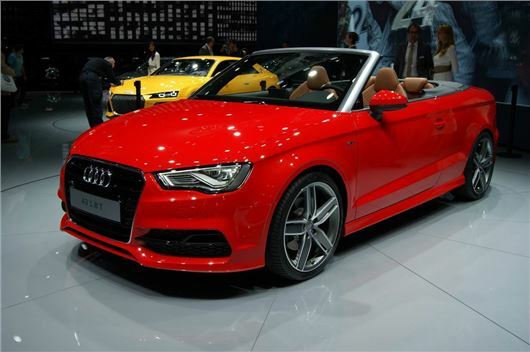 Audi has revealed the all-new A3 cabriolet at the Frankfurt Motor Show. The soft top variant of the A3 has a fabric roof which can be fully retracted and hidden under in 18 seconds. Initially there will be three engine options – 1.4 TFSI 140PS, 1.8 TFSI 180PS and 2.0 TDI 150PS. More models will be available in time, though, including an all-wheel drive, high performance S3. Deliveries start in March 2014 and prices should start at around £22,000. The new A3 Cabriolet gets a ‘bigger’ look than the outgoing model, appearing more like a shrunken A5 Cabriolet than the previous model, which didn’t do a brilliant job of hiding its hatchback looks. Its fabric top can be raised or lowered on the go at speeds of up to 31mph – when folded Audi promises it has little affect on luggage space of 287 litres. Even the entry level 1.4 TSI petrol engine offers reasonable performance – 0-62mph takes 9.1 seconds – along with decent fuel economy of 56.5mpg on the combined cycle. The 1.8-litre TSI also offered from launch manages 48.7mpg while the most frugal engine is, as you would expect, the diesel which manages 67.3mpg. Eventually an all-wheel drive S3 model will be available, powered by a 2.0-litre petrol engine with 300PS.